If you are familiar with any of the popular remodeling shows on tv, then you know that an “open concept” is a design element that nearly every homeowner requests. To create this open space, walls are knocked down, support beams are put in place and old single doors are replaced with beautiful French doors that allow more natural light to fill the space. The television designer often then decorates the home in a shabby chic or modern style. When they do this, you will notice that every window has a window treatment, including those French doors. But what about your home and your French doors or sliding glass doors? 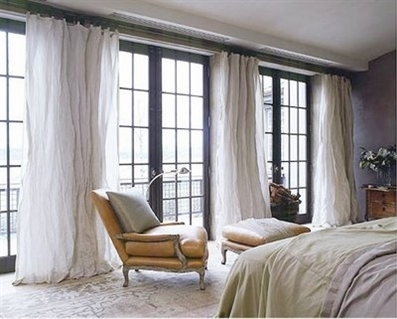 Adding beautiful floor-to-ceiling curtains will warm up any space, and French doors are no exception. To create this look, you simply need a ceiling-mounted curtain track, which we think is the best drapery hardware for dressing a French door. Often, there is very little space from the top of the door to the ceiling so adding a ceiling mounted curtain track is ideal. If you prefer a look where you can’t see the track, some of our tracks can be recessed into the ceiling giving your gorgeous curtains all the focus!If you have a wall of window or several doors that open to the outside, our curtain tracks can even be spliced together as one continuous design element. Adding curtains to your glass doors not only add a finishing touch to your room, they are functional as well! Simply pull them closed when you need some privacy. If you have French doors in your first floor master suite, consider adding Eclipse light-blocking curtains which help block out light and sound. Ready to be an interior designer like the ones on tv? Give us a call and let us help!